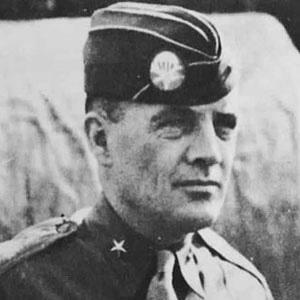 Commander of the World War II 101st Airborne division during the Battle of the Bulge. He graduated from West Point in 1918, right after World War I had ended. His troops were surrounded at the Battle of the Bulge, and the Germans demanded a surrender. McAuliffe's famous answer was: "NUTS!" He was buried beside his wife at Arlington National Cemetery. He and Creighton Abrams both commanded troops during the Battle of the Bulge.